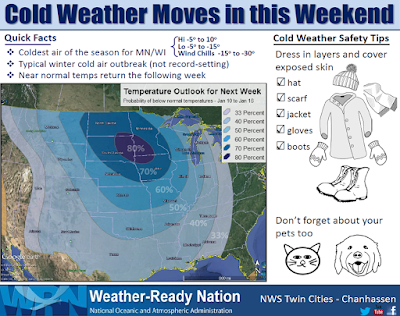 The National Weather Service offered an advisory to Minnesota citizens earlier this week about the expected spell of colder than normal weather which will start this weekend and linger through much of next week. This is likely to bring daily maximum temperatures in the subzero range for northern Minnesota, and just the single digits for the south, with common wind chill conditions that range from the teens below zero to -30sF. This Quick Fact Sheet was issued by the NWS earlier this week. In many cases the temperatures during the game did not indicate how severe the wind chill conditions were, ranging from the -20°F to -50s°F. In these 10 cold games the home team managed to win only 5 times (50%), but the west coast teams (Raiders and Chargers) managed only 1 win in 4 tries. We'll see what happens. 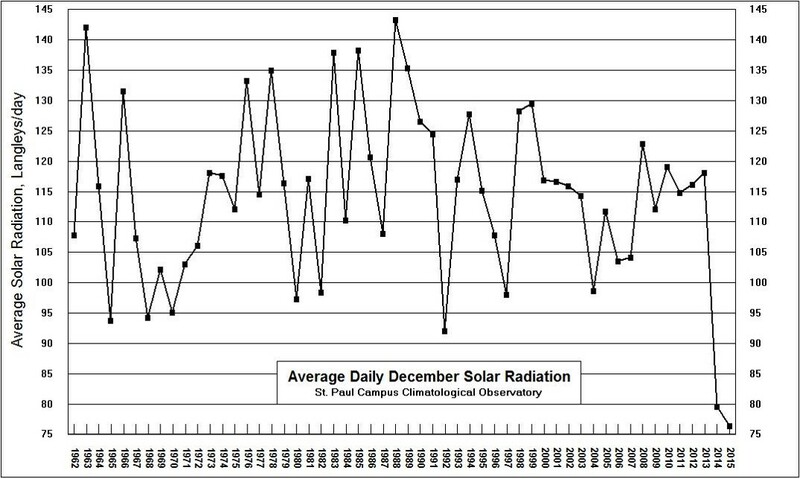 The University of Minnesota St Paul Campus Climate Observatory has measured daily solar radiation since 1962. This is a record of the total energy from the sun that reaches the Earth's surface here in St Paul. The daily amount is correlated highly to the elevation angle of the sun, day length, cloudiness, and turbidity of the atmosphere (smoke, haze, etc). 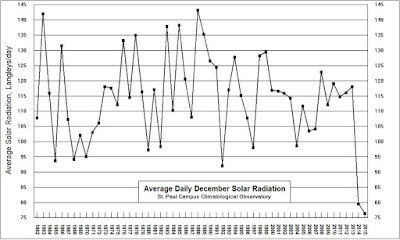 It is worth noting that last month brought the least amount of solar radiation for any December measured since 1962, breaking the record low value from last year. This is not instrument error or degradation. The instruments have been checked by Dave Ruschy, who managed the Climate Observatory for decades. So if your perception was that of a very cloudy December just past, these measurements sure substantiate it! Registration is now open for the 3rd Annual Minnesota Climate Adaptation Conference on January 28, 2016 at the Hilton DoubleTree in north Minneapolis. This conference is designed for local officials, planners, engineers, natural resource practitioners and others who want to learn more about adaptation strategies that have worked or are being tested in various sectors, tribal communities, energy, local foods, emergency management, communication and water resources. At the conference we will also hear from several major corporations about how they are addressing climate adaptation and listen to a mayors panel at lunch where they will discuss city approaches to climate adaptation. For the second year, Climate Adaptation Awards will be presented to recognize achievements in leadership, education, research, policies, or practices that improve resilience and advance climate adaptation in Minnesota. This week NOAA's National Centers for Environmental Information (NCEI) released their annual review of the 2015 climate for the USA. Countrywide it was the 2nd warmest year on record, trailing only 2012. The month of December was the warmest of record. According to the United Kingdom Meteorological Office December 2015 was the warmest of record across the UK dating back to 1910. Further December 2015 was the wettest of record, and also the single wettest month in history. According to the Australian Bureau of Meteorology it is likely that the current El Nino episode in the equatorial Pacific Ocean has peaked and will be on the decline in coming months. Their models project that El Nino will evolve into a "neutral state" by the second quarter of the year (April-June). A recent study from Stockholm University posted in Nature Geoscience suggests that high northern latitude lakes will likely emit from 20-50 percent more methane into the atmosphere under scenarios of 21st Century climate change. Such emissions will further accelerate the pace of climate change. As part of NOAA's Climate Resilience Toolkit there is a new web-based tool to increase awareness about climate change impacts around Lake Superior. It is certainly suitable for K-12 school use, and some communities leaders might wish to use it as well. Snowfall has been relatively scarce so far this winter in the Twin Cities. What is the average number of days that bring measurable snowfall each winter for the Twin Cities, and do you think the rest of the winter will bring more snow? The climate history for the Twin Cities shows an average of 40 days each winter that bring measurable snowfall (defined as 0.1 inches or greater). The largest value is 55 days in the winter of 1884-1885 and again in 1887-1888, and the smallest, only 19 days in 1890-1891 and again in the winter of 1930-1931. So far in the winter of 2015-2016 there have been 12 days with measurable snowfall in the Twin Cities. BTW the most for any one month is 18 days which occurred in the Decembers of 1969 and 2000, and again in January of 2011. As for the rest of our winter, I am sure we will have more snow, but overall the outlook models suggest less than the normal amount for the balance of winter. The average MSP high temperature for this date is 23 degrees F (plus or minus 13 degrees F standard deviation), while the average low is 8 degrees F (plus or minus 14 degrees F standard deviation). MSP weather records for this date include: highest daily maximum temperature of 54 degrees F in 2003; lowest daily maximum temperature of -7 degrees F in 1887: lowest daily minimum temperature is -30 degrees F in 1875; highest daily minimum temperature of 36° F in 1880; record precipitation of 0.33 inches 1875; and record snowfall of 2.5 inches in 1909. Average dew point for January 8th is 5 degrees F, with a maximum of 36 degrees F in 2002 and a minimum of -33 degrees F in 1977. The state record high temperature for this date is 60 degrees F at Fairmont (Martin County) and Winnebago (Faribault County) in 2003. The state record low temperature for this date is -48 degrees F at Moorhead (Clay County) in 1887. State record precipitation for this date is 1.14 inches at Tamarac Refuge (Becker County) in 1989; and record snowfall is 17.0 inches at Isabella (Lake County) in 1969. Arctic cold prevailed on January 8, 1887. Following a fresh snowfall during the first week of the year, temperatures fell on the 8th to -48°F at Moorhead, -37°F at Morris, -28°F in the Twin Cities, -25°F at Albert Lea and Rochester, and -24°F at Duluth. During the second week of the month temperatures rebounded into the 20s and 30s F.
A slow moving winter storm brought heavy snowfall to the state over January 5-8, 1969. Many northern communities reported over 10 inches of snow. The central part of the state reported 6-9 inches. It turned out to be a very snowy month of January, as 10 northern communities reported more than 40 inches. Isabella reported a record 63.1 inches of snow that January. Arctic cold air dominated Minnesota on January 8, 1973 with 14 northern climate stations reporting morning lows of -40°F or colder. The temperature never rose higher than -13°F at Crookston that day. The warmest January 8th in state history occurred in 2003 when over 60 southern and western communities saw afternoon temperatures soar into the 50s F. Bright sunshine, absence of snow, and modest southerly winds enhance the warmth. Some people took lunch outside in short sleeve shirts. Saturday will be a change-over day with strong winds ushering in much colder air. 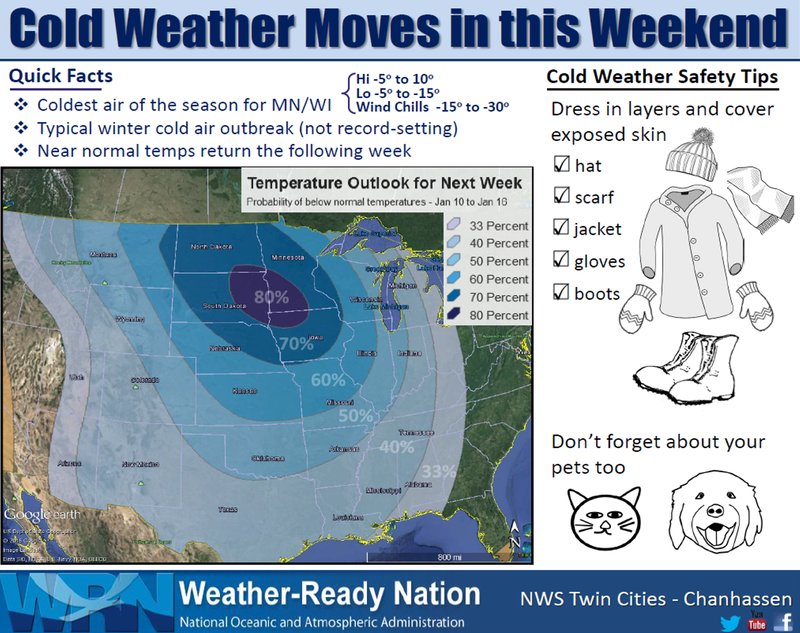 Colder than normal temperatures will dominate through the weekend and well into next week. Highs will range from single digits above zero in the south to single digits below zero in the north. Some moderation in temperatures closer to normal will occur by the end of next week.